Dr. Merryll Vorster is back on the stand and Nel is still conducting cross-examination. The application that was mentioned yesterday has not been brought forth yet. They are discussing the diagnosis of generalized anxiety disorder (GAD). Vorster explains that the word disorder implies impairment, which then means that Oscar suffered from some level of social and occupational impairment throughout his life. Vorster says in general, anxiety is very common amongst people. People can have anxiety with or without the disorder. Nel wants to know what differentiates every day anxiety from a diagnosed disorder. Vorster says in order to diagnosis somebody with a disorder, that person needs to have the anxiety more often than not for an extended period of time. The issues of what the person is anxious about are out of proportion with reality. The reaction to the anxiety is associated with various symptoms such as sleep disorder, appetite disorder, vomiting, nausea, sweating, diarrhea, irritability, inability to concentrate and distractibility. People with this disorder are not able to set their worries aside. They think about them constantly. Vorster then talks about the fact that all disorders can either be mild or severe. A severe disorder would greatly affect your ability to have a normal life. She states that there is no evidence to suggest that Oscar had a severe form of the disorder. He was able to function at a high level as an athlete and he still socialized. He had distress because of anxiety, but could carry on with normal life. Nel reminds her that yesterday she stated that Oscar’s GAD may have been relevant (on his version) to his actions on the night of the incident. Vorster says, that is correct and it would be for the court to decide if it’s relevant. Nel says that there was evidence given from friends and a former girlfriend in this case and none of those individuals stated that he had any type of anxiety issue. Vorster says people can control and conceal their anxiety. 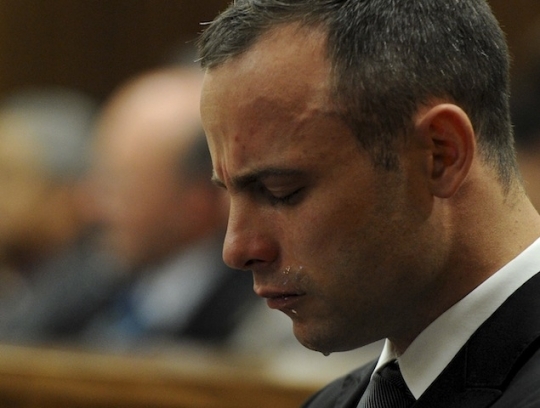 Vorster points out that Oscar said that his family was not even aware of his anxiety issues. Again, Oscar can say whatever he wants to the doctor. It’s all his own word which has been proven in court to not be of much value. Nel says, but it hasn’t been mentioned by anybody that they observed Oscar being anxious. Vorster says that it did come up in the collateral information that she obtained (from Oscar’s family, coach and manager). Nel brings up the three statements from Vorster’s report that she mentioned were included yesterday – affidavits from Justin Devaris, Samantha Greyvenstein, and Graham Binge. Nel asks her if she received them from the Defense team. She says, yes. He also asks her if these are the only statements that she had the opportunity to peruse. She says yes. We’ve all seen this in court before, the Defense only gives their expert the information that is of benefit to their side rather than all of the relevant materials in the case. These three individuals testified in favor of Oscar at his bail hearing back in Feburary, 2013. Since that time, it has been reported that Justin and Samantha no longer have a friendship with Oscar (although, I cannot substantiate that). The Defense made a decisive move not to call Justin Devaris to the stand. You can read between the lines. 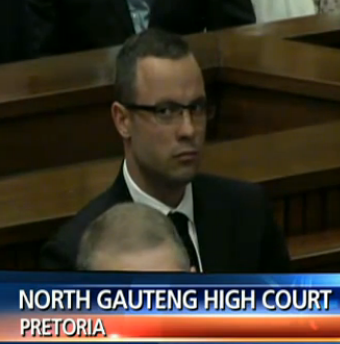 Nel asks Vorster if she took in to account that Oscar was severely anxious about crime in SA when diagnosing him. She answers, yes. Oscar told her that he took excessive security measures. He moved to a housing estate (Silverwoods) where he would be more secure because of the guards at the perimeters. After he found out that there had been some burglaries there too, he became more concerned that he still wasn’t sufficiently secure. He then added dogs, beams around his house, an alarm inside the house and he locked himself in his bedroom at night. He informed Vorster that he intended to move from that estate because he no longer felt safe. He was in the process of moving to Johannesburg. Vorster felt that the measures he took were more than the average South African would take. Nel asks her why she considers his measures to be more than average. She says it’s her own perception. Nel asks her if she agrees that most people have burglar alarms, often with beams. She says, yes. Also, don’t most people have dogs? She agrees with this too. Nel doesn’t understand then why she thinks his measures are excessive. She says that most people don’t lock themselves in their rooms at night. Nel says, that’s interesting considering evidence was given in court from neighbors who did the same thing. Nel suggests to her that she is showing some level of impartiality to the accused because in Nel’s view, the security measures mentioned are quite common in South Africa. She disagrees that it shows bias towards Oscar. She was trying to evaluate if he was paranoid, which she found he was not. She states she is not a security expert, and these are just her opinions from being a South African herself. First, the Defense specifically brought forth evidence that Oscar’s dogs were not guard dogs. Mr. Stander testified about how friendly and docile they were. There weren’t even reports of them barking during the incident. They were also playful with the police when they were there to investigate. You cannot all of a sudden say that they were guard dogs for his safety. If Oscar really intended to have dogs as guard dogs, he would have made sure to secure the appropriate dogs for that purpose. He did not. Second, evidence was presented by the Defense that Oscar was moving to Johannesburg to be closer to Reeva, so they could live together. The Defense has been bending over backwards to prove this supposed intense love that Oscar felt for Reeva… now he tells his psychiatrist (in the last few weeks) that he was moving to a new house in Johannesburg because of safety concerns? Just one more inconsistent story. Nel says that if a person has GAD, wouldn’t you expect that the person would have taken even more measures to security the rest of his house (not just lock himself in his bedroom). She says yes, she would expect that. Nel tells her that there was a broken window downstairs on a window with no burglar proofing/bars (which he acknowledges they are not allowed to do at their estate) and Oscar wasn’t overly anxious to have it fixed. It was broken for days. She doesn’t think this is weird; he may have been reliant on his sensors and beams. Nel says, that would be the perspective of a normal person but we are dealing with somebody who has GAD. She agrees that one would not likely leave a broken window for an extended period of time. Also, let’s not forget Oscar’s dodgy testimony about the painting of his house and the possibility that the sensors were not put back on properly. Oscar went to great pains to make it seem like his alarm system may not have been 100% reliable and he admitted that he did not have it tested after the last house painting to make sure. He also admitted to not checking to see if the ladders were outside. It was proven in court that he was not meticulous about his security measures. His testimony does not match what Vorster is now trying to say. I don’t necessarily blame her, because she’s just relaying what Oscar told her but there are very clear disparities. Roux objects and says that it’s not accurate that Oscar wasn’t concerned about whether or not his security alarm worked. It was only one sensor outside, not the whole alarm system inside. Nel says the record will show that the evidence ended with the beams, but it started earlier with the alarm system inside. 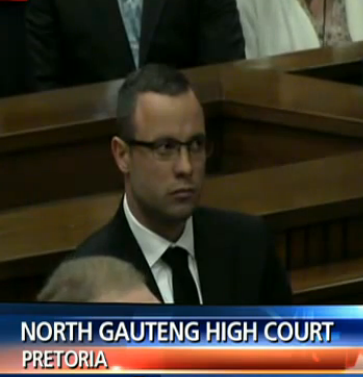 The Judge agrees with Nel but asks him to be more specific with his question to avoid any confusion. So Nel asks Vorster, a person with GAD would insure that their alarm system is functioning properly? She says, yes. Next, Nel wants to know if the doctor agrees that for a person with GAD who is concerned about crime, they would not be able to sleep with their balcony door open and not secured/locked. Vorster says she can’t directly answer yes because it depends on who the person is living with. If they live alone, it would be up to the person to ensure that the house is locked and secured. But if they were living with another person than they may need to consider that other person’s needs and comforts as well. So she will give him a conditional, yes. Nel says, but then wouldn’t it be an issue for that person to sleep. Even though their partner may be comfortable, the person with GAD would likely be laying there anxious about the door being open. Vorster concedes that it could be an issue. Nel asks Vorster if she is aware of the incident with the police while Oscar was returning from the Vaal River. She says she would need specific questions to be able to answer. Nel tells her about the incident. He relays that Oscar’s friend had some type of disagreement with a police officer. Nel wants to know if for a person with GAD, wouldn’t they be anxious about this situation. She says, yes, the person would likely be afraid that they’d get in to trouble. But they don’t really get in to what he would or wouldn’t do, just that he would be more anxious than the average person in that situation. But to Nel’s point, Oscar hopped out of that car and had no qualms about arguing with police, especially when they unloaded his gun. To me, those do not sound like the actions of an anxious person. It sounds more like something a hot head would do. She again points out how common it is for people to have GAD. It’s like the Defense is walking a tightrope of trying to say that Oscar didn’t act normally that night because of his anxiety, but they don’t want to fully commit to him being a disordered person. Nel is calling their bluff with this application. Either his disorder is severe enough to cause him to act differently, which then requires by law that he be referred (examined) under Section 78… or it’s not severe enough, in which case it has no relevance whatsoever in the case and Vorster’s evidence should not be given any weight. Nel asks her if Oscar coped with his life growing up, and she says yes, he did cope well. Nel establishes with Vorster that she stated yesterday that her report could either be used for the merits of the case or for sentencing. It would be up to the court to decide how to use it. Nel says, as far as it potentially being used for sentencing, is that why you included his depression and remorsefulness in the report? She says, no. The depression after the incident is simply as part of his current mental state. She doesn’t know if this would be a factor if he were to be sentenced or not. Nel asks, so then what portions of your report would be relevant to the sentencing process? Would it be the remorse and the guilt? She says no, it would be the GAD diagnosis and the vulnerability. Nel points out that these points could go to merits as well, and she agrees. Nel has reviewed the portion of her report from Dr. Richard Holmes and comments that he is registered as an educational and industrial psychologist, not a clinical psychologist. Nel wants to know what the purpose of his report was. She doesn’t know. Nel asks, how did it assist you? She says it contained history and he also had a clinical psychologist who did testing on Oscar. The history and the test results matched her own impressions of Oscar after she met with him. Nel wants to know if this clinical psychologist’s findings played a role in her own findings, and she says, no. It was just another source of information. Nel asks if Dr. Holmes’ report was for forensic or therapeutic purposes. She thinks it was forensic. 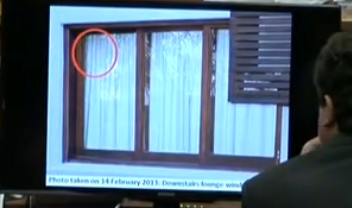 Nel says that in her report, she based her conclusions on Oscar’s version of events. She agrees. She did not take in to account the State’s version. She also states that she did not have it. No surprise. Nel asks if she thinks that is impartial. She answers, no. She stated in her report that it is based on what the accused told her and it’s up to the court to decide whether his version is a reasonably possible version. Her asking for Oscar’s version was not to come to the truth of the matter but rather to look at his mental state at the time of the offense. Nel asks, if this is the purpose of your report, to determine his mental state at the time of the event, wouldn’t it have been better to have all versions available to you? She says it would have been an advantage to have them but at the same time, she wouldn’t have been to determine which version the court would accept. 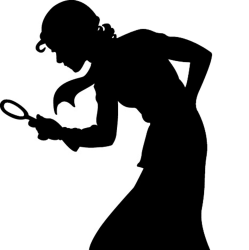 Nel asks, but shouldn’t an expert want to have all of the information before making a finding? She says she would be happy to look at alternative versions and comment on them to the court today, but all she had available to her at the time was Oscar’s version. She then says that she was given a transcript of Oscar’s evidence in court, but she didn’t go through it because it’s not necessarily the version that the court will accept. Oscar wonders if different versions would have affected her opinion that GAD played a role. She says, no. The diagnosis stays constant, it played a role at the time of the offense, and that would be regardless of which version the court accepts. She says it’s up to the courts to decide what the accepted version is and how this diagnosis may factor in. Nel asks, if the court finds that Oscar knew that Reeva was in the toilet room and he fired to kill her, would GAD still play a role? She says, yes. Nel asks, how does it play a role? Vorster answers because a person with GAD would be anxious about losing a relationship. Nel asks Vorster, so then you presuppose that there would have been an argument about the relationship? She answers, if there had been an argument about the relationship, a person with GAD would have had increased levels of anxiety. It could play a role in the build up (prior to the shots) but does NOT play a role during the shots. Everyone was listening very intently during this exchange. Nel says, but all people get anxious during arguments. She agrees, all people get anxious and upset during arguments. That is the nature of an argument, it’s an emotional event. Nel wants to know why the fact that a person with GAD who shot and killed a person and was considered a danger with a gun was not included in her report. She says, people suffering with GAD are not dangerous as such. “People with GAD probably shouldn’t have firearms.” That is the element of the dangerousness. The person alone is not to be considered violent, but if you add in a firearm, then you add in risk that they may be involved in violent activities. 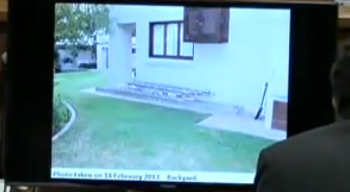 Nel asks Vorster if she is aware that Oscar purchased more guns in 2012, and she states that she is aware. She comments that he is a gun enthusiast. Nel asks, so it wasn’t just for his own safety? She says, no, it wasn’t. Nel asks her if she ever consulted the father. She says, no. Nel asks, wouldn’t it have been valuable, considering he is the only remaining parent, to get information from him. She agrees, it would have been advantageous to see the father. Sounds like the Defense and the Pistorius clan kept Henke out of this whole process. It seems those pesky .38 Specials in the safe continue to be a problem. Daddy needs to stay hidden. Nel points out to her that she diagnosed Oscar with having GAD from the age of 11 months old, and also reported that he suppressed it as a child. But by all accounts, Oscar was a well-adjusted child at 17 months who was thriving. Nel says, a child that young does not have the ability to suppress anxiety. His family would have picked up on it. Vorster answers that these are the factors that contributed to his GAD developing. I guess she is now saying then that he didn’t fully have GAD then, it was just the beginning stages of it developing. Nel wants to know then, how did she know it was developing if he’s coping just fine? She says that all children who have amputations at that age have difficulty adjusting. So essentially, she is making a general assumption and not basing it on any real fact that Oscar was developing GAD. Nel points out to her that making an assumption is very different thing than making a finding in a report. Nel moves on to when Oscar is a little older, around 14 years old. He was doing well in school, playing sports and socializing. He was coping well. Nel wants to know why the doctor is making a finding that Oscar was suppressing his anxiety. Where is the proof? She states, because he was always encouraged to be as normal as possible, he had to suppress his anxiety. This would once again be taking Oscar’s word for it. She then goes on to say that when she diagnosed Oscar with GAD, she said it was “likely” that this had been going on for years. Also, Oscar did not know before now that he had this diagnosis. He supposedly didn’t know that he had a treatable condition. Nel reads her report to her where she basically expresses that Oscar’s anxiety began at 11 months, and wants to know if he is misunderstanding her report. She says that perhaps she expressed it wrong. The anxiety disorder is something that has developed over time and the factors that should be taken in to account when making the diagnosis, commenced when he had the bilateral amputation. Nel says, now we understand each other. Nel asks, if at the age of 14 he was able to cope with his disorder and conceal it, how would it be getting worse? She answers that as his stresses increased, his anxiety would have increased. Again, assumption, not fact. Nel addresses the death of Oscar’s mother and states that any child losing a mother would be traumatized and their levels of anxiety would increase. Vorster agrees with this. Nel says, so this is not really a factor that is uncommon. Then they talk about when Oscar started traveling more, and he reported not seeing his family as much. Nel says, isn’t that what happens in life. People grow up and this is common. He is methodically going through all of the points in her report to illustrate that there really is nothing that is way out of the norm. These were pretty much my same thoughts yesterday when I first heard her report. It sounded like all the usual and expected ups and downs that people experience throughout life. Nel also wants to make the point that the death of Oscar’s mother would have been the most stressful thing in his life and wouldn’t it have been very difficult for him to control his GAD after this? She answers, no, and again explains how people with GAD can conceal it. Nel wants to know what information specifically was used to elevate Oscar’s anxiety to a disorder. She says that clinically he presents with an anxiety disorder. He appears to have an anxiety disorder. And then if one takes in to account the history that HE provides, then you can see the symptoms. The collateral information obtained by family members, his manager and his coach confirmed his history of anxiety. So to sum it up it was history + clinical presentation + collateral information. Nel wants to discuss the timing of her report. He says a person who is accused in a high court matter, that has given evidence, must be anxious… and this is the first time you’ve seen him? She says, yes. Nel asks, would that have been a factor for you? She says, no. He asks, why would you say no? She says that most people seeing a psychiatrist for evaluation will be a little bit anxious but the history, collateral information and clinical presentation were all indicative of GAD. But she does concede that a person who is involved in a murder matter who has just given evidence and been cross-examined, would be more anxious than a person who is just coming in for evaluation. Nel wants to know if he had global dysfunction because of the GAD, meaning having dysfunction in all aspects of life. She says socially he was coping, and he had friends that he had maintained over the years which is normal, but his new friends that he was spending time with were people that he kept around so he wouldn’t be lonely. They were not people that he could confide in. Also, his sexual relationships all appear to be quite short in duration. She doesn’t necessarily think that his socializing was healthy, but he did overall function socially. This sounds to me like a personal judgement, not a clinical assessment. I’m surprised to hear her say that his sexual relationships were all quite short. He reportedly dated Samantha for one and a half years, and dated a handful of other girls each for a few years at a time. It all sounds pretty normal to me for a young guy. Nel says that the fact that a young man might not make close friends or that he has short term relationships is quite common. She agrees that it’s common. And GAD is common. She is insinuating that perhaps they are linked. Nel then says… but it’s not common to shoot and kill somebody in your house. And she agrees, that is not at all common. Nel says, and you are bringing in that GAD played a role. She says that she is introducing it as a factor that GAD may have played a role and that is for the court to decide on the facts of the case. Vorster then says, what Oscar told her was: “he thought there was an intruder, he certainly armed himself and walked towards that danger and he certainly fired shots at the noise as he was scared.” Nel confirms with Vorster that Oscar said HE fired AT the noise. Nel says, he fired four times at the noise. She says, he did not specifically say how many times he shot but we know that he fired four times. Oscar has had his head down this entire morning of testimony. I think he has looked up once or twice all day. Nel asks, do you know that Oscar denies that he fired at the noise? She says, she doesn’t know what he said in court. She then says it may have been difficult for him to remember firing the shot if he was so frightened. Nel says, that’s interesting because I’ve never said that he didn’t remember firing shots. Her statement implies that she is indeed aware of what he said in court. For her to claim that she was given a report of his testimony, but didn’t read it, does not ring true to me at all. She was hired to evaluate him. Of course she would read his testimony. 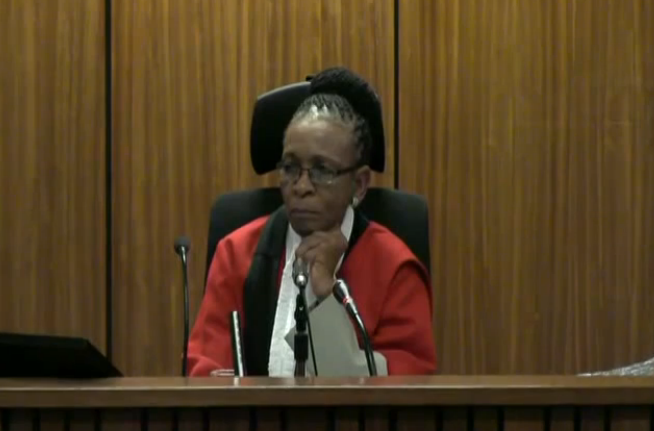 Nel is pointing out to her that he told the court one thing and he told her another. It has nothing to do with him not remembering, he told you directly that he fired at the noise. The doctor is trying to explain it away that under extreme fear, he may not remember all the aspects of the incident but her argument doesn’t make sense seeing that he has clearly given two versions of it. Nel says, there could be another explanation… he could be lying. And she says, yes… he could be lying. 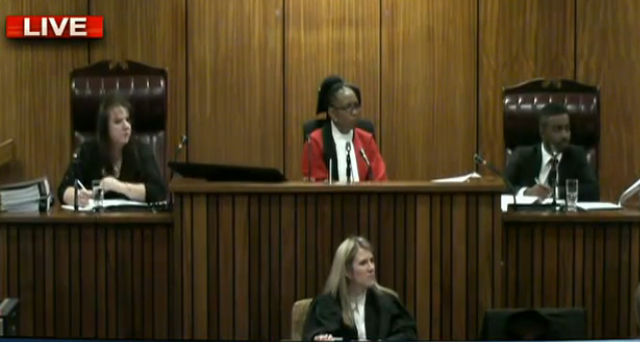 After a short break, Nel comes back and once again addresses with Dr. Vorster that she testified that the GAD may have played a role in Oscar’s actions on February 14, and GAD is a psychiatric disorder. She agrees that the psychiatric disorder may have played a role. But, Nel establishes that it only played a role in line with his version of events. Nel also establishes that there have been no psychiatric evaluations in line with other versions brought before the court. Vorster says his psychiatric diagnosis would remain a constant, but it hasn’t been applied to other versions. Nel confirms with Vorster that the GAD does not come in to play as far as Oscar knowing right from wrong; it’s more in his ability to act in accordance with that understanding. Nel says, this is then in accordance with Section 78, part 1B (not 1A). See link below to read the act. Nel also confirms that GAD is contained in the DSM-5 (Diagnostic and Statistical Manual of Mental Disorder, version 5). This means that GAD would qualify as a mental disorder, as do all other disorders listed in there. 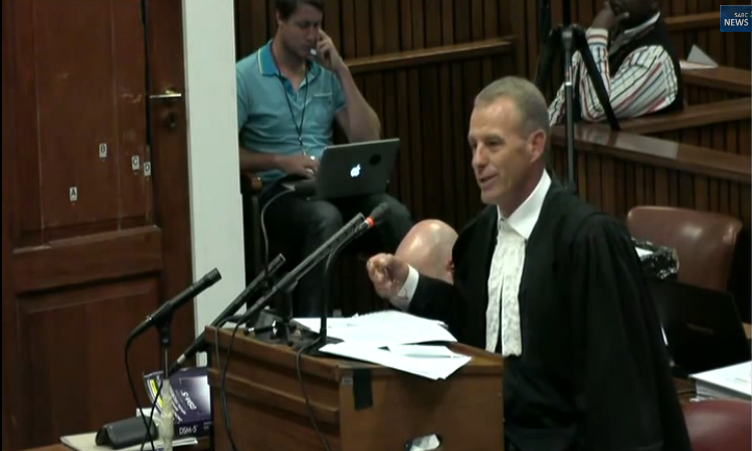 Nel concludes by stating that making a diagnosis is in the realm of the psychiatric experts, whereas the factual findings on the offense are in the realm of the court, and Vorster is in agreement. Nel rests. Roux requests a ten minute adjournment. Vorster acknowledges her words from yesterday and goes on to say that if one looks further at the mental health act, where one could be an involuntary patient, this would not be a diagnosis that would render one as in need of involuntary care or treatment. Roux asks about her experience with people who are typically referred for observation. She states that she has seen many hundreds, if not thousands, referred for observation and in her opinion, a diagnosis of GAD would not be one of the reasons you are referred. GAD does not render one unfit to stand trial or make one unable to appreciate the wrongfulness of their acts. Roux addresses delusions and paranoia and points out an example from Vorster. If Oscar’s version was that he heard a window sliding open and the common cause facts are that the window was closed the whole time, would that be a factor she would take in to account potentially rendering him delusional? Vorster says that people who have GAD can wake up at night and hear noises and think it’s something other than what it really is. That’s not really a delusion. But if there was a delusion that people were trying to break in to one’s house, in terms of a paranoid belief, then one would say that this person has lost touch with reality and should be referred for observation. Roux says the evidence is that Oscar heard the window sliding open and the common cause facts in this case are that the window was open. They have photos of the scene to prove it. The second part of his evidence is that he heard the toilet door slamming and it was indeed closed. Vorster says an anxious person who thinks there’s an intruder in the house, who then hears the toilet door close, will become very fearful. Roux goes on to say, it’s not like we are talking about a delusion here. The toilet door was closed and the window was open. Vorster says yes, this is not in the realm of delusion. Roux asks her if she looked for delusion and paranoia in this case and she says, yes. She looked for it but didn’t find it. Roux says, as you stand here, you don’t make an allegation that he must be referred. Vorster answers, no. Roux now wants to address her saying that Oscar is a dangerous person due to the disorder plus the firearm. Roux tells Vorster that there was evidence of an assault where Oscar was hit from behind and he needed medical attention, and he had his firearm with him but did not use it. What does she say about that? Vorster says that Oscar was obviously able to maintain a sense of responsibility and not use his firearm irresponsibly. It’s very convenient of Roux to not mention the Tasha’s incident, the Vaal River incident or the time he pointed his gun at the people who were following him in his car, but instead pick the incident in which Oscar was noticeably vague when providing details on the stand (claiming he never knew who hit him). Give me a break. Should we give Oscar an award every time he doesn’t pull his gun out or shoot somebody? Roux now addresses the issue about Oscar locking his bedroom door at night. He points out that not only did he lock his door but he also wedged his cricket bat in between the door and the display case to prevent anybody from getting in. He wants to know if this information supports Vorster’s thoughts about his anxiety and she believes it does. The Judge calls out Roux on this and says “there was a reason for that, wasn’t there?” Meaning there was another reason why Oscar supposedly had the bat in that position. Roux has his confused face on. The Judge reminds him that there was an issue with the key mechanism. She is absolutely right! She is paying attention. On direct, Oscar stated that the lock mechanism on his door is not very strong. So he uses this bat for extra security up against the door since the lock itself is not reliable. Roux doesn’t recall the testimony and says he’ll make a submission about that, and moves on. The next topic is the broken window downstairs. Roux says that the new glass was already on the premises and Oscar was just waiting on the contractor to fix it. But he doesn’t mention how long it sat unfixed for. 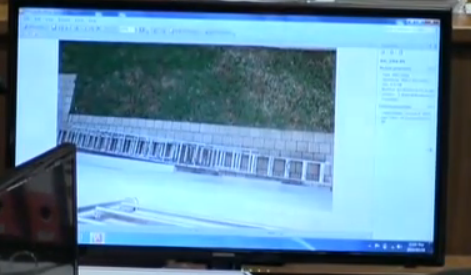 As for the ladders, Roux points out that Oscar had given instruction to the contractors to lock them away. Again, he leaves out that the contractors had not done that and it was apparently of no concern to Oscar because they were sitting below his bedroom window (not the bathroom window). Good of him to leave that out too. Roux says to Vorster… “You were asked about other possible versions of the event. Relevant to the shooting incident, there was only one witness and that is Mr. Pistorius, so it’s how you interpret his version. It’s not that there’s somebody else coming to court and saying that’s not what happened, in fact I saw the following.” She says, yes, there’s only one witness. That’s not entirely true. He may be the only eyewitness but there are plenty of ear witnesses. Their evidence counts too, plus the enormity of the physical scene. It’s completely misleading to even make that statement that he’s the only witness therefore what he says should be the only version to interpret. Why even bother to have trials if that is the case? Roux addresses the mother’s death and ponders that if you add in an absent father, wouldn’t that play a role? Vorster goes on about how her death would be stressful but he then had to rely on his siblings and aunt for emotional support. In regards to Oscar meeting with Dr. Vorster after he gave evidence in court and being excessively anxious, Roux points out to the doctor that she’s also seen many people prior to them giving evidence and they are anxious as well. She agrees. She doesn’t think it makes a difference. It’s anxiety provoking for everybody. Vorster tells the Judge that many people are referred for examination, including those with PTSD, and that does not necessarily mean that they will be found to have that disorder affecting their ability to stand trial or their responsibility. They move on now to Oscar firing at the noise. Roux wants to make sure that Vorster understands what Oscar said in court. He states that when Oscar was standing facing the toilet door, he heard a noise from the inside which he perceived to be the person(s) coming out and he… Roux catches himself there and removes “he” from the sentence, and instead says… “that’s when the firing took place.” They always have to be very careful to label it as random, no blame attached, firing. The Defense and Oscar constantly have to tap dance around their words. There would be no need to do that if Oscar would just give a genuine account of the story. But we are way too far gone for that. Roux says the noise precipitated the firing. So does Vorster see this as contradiction, as Nel suggested? She says, from a psychiatric perspective, it doesn’t make a difference. I like that she added in “from a psychiatric perspective”. She’s absolutely right. From a legal perspective, his choice of words makes all the difference. Nel tells the Judge that he is ready to hand up his application to the court, as mentioned yesterday. 1.This pertains to Section 78, 1B and 2, and Section 79 of the Criminal Procedure Act. 2.The Defense called Dr. Vorster. She’s a well-known, respected psychiatrist. 3.The purpose of her evidence was to present to the court psychiatric factors that may be of reference to conviction and sentence. 4.She specified that Oscar suffered from GAD. 5.She testified that the diagnosis is directly relevant to Oscar’s version and in her opinion, the GAD may have affected Oscar’s ability to act in accordance with an appreciation for the wrongfulness of his act. 6.GAD is a psychiatric disorder. At the least, it’s a psychiatric factor that impacted on Oscar’s ability to act in accordance with his understanding of wrongfulness. 7.GAD is listed in the DSM-5. Nel then reads point 2 from Section 78. See the link above in this post for the full content of point 2. Nel says in bringing this application, they are mindful of the practical implications and if granted, an expensive delay in the matter. They have taken in to account the provisions of Section 78, 1A and 1B, and although the current Defense team may indicate that it was never their intention that the GAD is part of the accused’s defense, the matter doesn’t stop here. Accused persons in the past have replaced their counsel particularly when things go wrong. Even though the court will take in to account the views of the Defense team, the facts before the court is of more importance and the case law would bear that out. 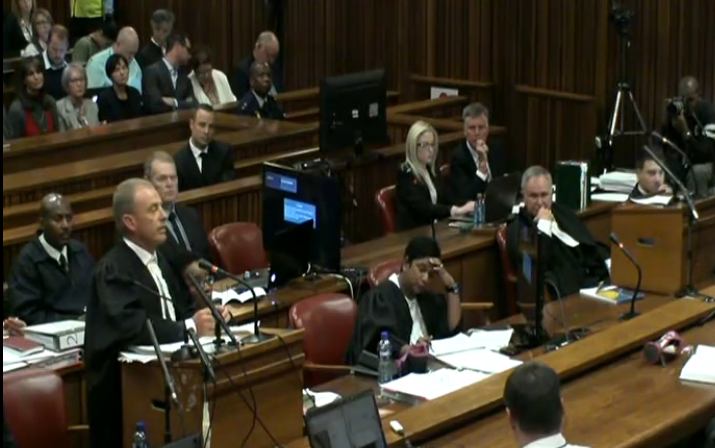 Nel says its fact that the Defense elected to call Dr. Vorster at this late stage. There had been no indication prior to Dr. Vorster giving evidence of any psychiatric condition that may have affected the accused. Nel says that the plea statement may indicate vulnerability and that he was anxious about the crime, but so is everybody in this case. The fact that it is a psychiatric diagnosis may play a role and must play a role, and that is what they have based their application on. Nel lists the people who know Oscar who have come to give evidence and there has been no indication of an abnormal level of anxiety. Nel also says, in fact, Mr. Roux reminded him of the incident where people assaulted a taxi driver and Oscar witnessed it. For somebody with GAD, it must have been an unbelievable stressor. But Oscar was able to control himself. And yet, the Defense calls Dr. Vorster as a witness who indicates that the GAD may have been a factor on the day in question. Nel reads some case law for the court. Then he tells the Judge that the timing of this evidence should be taken in to account. The consultation and presentation of evidence happened subsequent to the accused testifying, and subsequent to the accused’s experts giving evidence. Nel says, “My Lady, there must be a reason why that consultation would take place at that time.” Nel says the Defense can use this on appeal if we don’t refer. The court could very well question why the accused was not referred if psychiatric issues were brought up. But if this was part of the Defense’s intention, then why did it happen when it did. One could view it as a fall-back position. Nel tells the Judge that this should be significant. Nel now addresses another paragraph in his argument. He states that we’ve had in this matter a defense of putative self defense. Which then in chief turned in to “I acted automatically.” Now they have a witness being called by the Defense saying the accused definitely did not act automatically in a state of automatism, but a psychiatric disorder may have played a role. Nel says, if one is confronted at this stage of trial by three different defenses, then the court should err on the side of caution expecting that there could be yet another defense. He says there should be red lights going off to the court and they should err on the side of caution. Next, Nel says they made a point and they put it to Dr. Vorster that the accused was not the most impressive witness. That caught Oscar’s attention. His head popped up when he heard that. Nel says that they will argue that his testimony should be rejected. Nel says, “isn’t that the only reason why a psychiatrist is consulted after his evidence?” If this had sincerely been the Defense’s case from day one, why did they only consult with her when they did? Nel says, this is why he is arguing strongly that the timing of the consultations and the witness being called is important. He refers to some more case law. Nel believes it is best that the doctors examining him have a global view of the case, not just one version (his version) that was given to Dr. Vorster. The court is entitled to know what the accused’s defense is. Nel adds that the process in terms of Section 79 that would be followed, apart from all the different psychiatrists that would be appointed, is for the panel to make a finding if a psychiatric condition existed at the time of the offense. They would also need to make findings in regard to whether or not the psychiatric condition or mental illness played a role in the commission of the act, and to what extent. He believes it’s important for the court to know this. He says the risk that the Defense took in calling Dr. Vorster at this stage of the trial has already indicated that there’s a reasonably possibility that it may play a role. Nel also says, if the court were to ask him directly if he thought it played a role, he would answer no, it didn’t, and he would argue that. He says that Section 78 has a low threshold and the court should act in terms of that. Nel rests and Roux gets up to object the application. He begins by saying that Mr. Nel’s reading of the law reports is rather unfortunate. Roux reads from the law books. Roux says the State wants a second opinion and wants the court to assist with this. Roux disputes that Vorster stated that Oscar may not have acted in accordance with his understanding of right and wrong. She did not claim him to be delusional or paranoid. He says it’s for the court to find what is relevant. 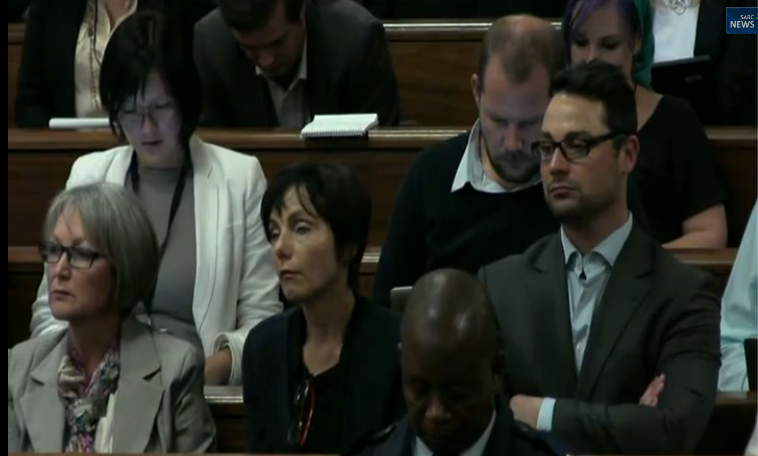 Roux says that Nel is trying to suggest to Dr. Vorster that it’s a 78 situation. Roux read Section 78, part 1. See above for link. Roux does not believe that the state has said anything that warrants a 30 day evaluation. Roux then references the court record from yesterday and looks for an exchange that he had with the Judge. He tells her “with great respect, you’re absolutely in debate with some of the position and I want to show you where it is.” She doesn’t look too pleased. The record reads that the Judge stated to Roux: “In other words you say it’s not an allegation? There must be an allegation first.” Roux says, “absolutely, My Lady, that’s why I object.” Roux says an allegation cannot be a mere allegation; it must be supported by facts. Roux says for the State to bring up that there are three different defenses is irrelevant. And the reason that counsel would do this is because your case is not good enough on what you argue. He also says for the State to allege automatism is also incorrect. Dr. Vorster clearly stated that was not the case. Roux is fighting this pretty hard and getting worked up. Roux also says they have a further witness who will talk about the fight and flight response, and the vulnerability of disability. Not related to Section 78, but in any event, even if there’s a question mark in the court’s mind, which there should not be, there’s another witness coming and it’s premature because what if that witness says something that requires the accused to be sent off again. What if he is sent away for 30 days on the GAD, and then sent away again for another 30 days on the next part. Roux says, apart from the absence of merits, it’s a premature application and the state is welcome to bring another application after that witness. 1A) Every person is presumed not to suffer from a mental illness or mental defect so as not to be criminally responsible in terms of Section 78, until the contrary is proved on a balance of probabilities. 1B) Whenever the criminal responsibility of the accused, with reference to the commission of an act or omission which constitutes an offense is an issue, the burden of proof with reference to criminal responsibility of the accused shall be on the party who raises the issue. Roux proclaims that they do not raise the issue. The onus should not be on them. Roux rests. Nel stands back up and says the one thing he agrees on with Roux is that they should not be emotional. He says that its one thing for counsel in 2 minutes to read a case that the State has referred to and tell the court that the State doesn’t know what they’re doing in the matter… but the 1991 case that he cited previously was one in which HE was the counsel. He knows the case by heart. In that case, he was arguing for the matter not to be referred, just as Roux is doing now, and he lost! Nel says he referenced these cases for a reason and they are there for the court to read, and he stands by them. It was quite an interesting, in your face, moment there by Nel. As for Roux’s argument about calling another witness… Nel says, “let ME now use the word unfortunate.” The fact that the Defense says they have another witness, should be considered holding the court for ransom. But in addition, the fact that they then said after that next witness the State can bring their application again, is a clear indication to Nel that they are on the right track with this application. Nel says, he too would be emotional if he called a witness and that witness left open the door for referral of his client. If Roux is telling the court that he’s going to do this again, bring evidence that puts Section 78 in to question, then that should be a clear indication to do the referral now. The Judge will be back tomorrow morning with her decision. They adjourn. Thanks juror13. Great report. I must say, I am impressed with this judge. How she stays so focused is beyond me. I would have been stifling yawns, and writing out my shopping list if I had to sit there listening to all the evidence, day after day. Thank you very much, Lisa Salinger, for all of your hard work! It is much appreciated, particularly your insights into the significance of points made by both prosecution and defense is. Meanwhile, please, please tell me that the pic of cry baby OP (which leads off this article) wasn’t during Dr. V’s testimony about HIM (Him, him). If it is, what sorry, self-pitying sack of dog go he is! Thanks, Chris. OP was indeed crying that day. But not so much when Nel started suggesting a mental referral. OP told reporters after court that it was a “joke” what Nel was suggesting. Then after Masipa ordered the referral, that Roux fiercely fought against, Uncle Arnold made a public statement thanking the court. They are all just a bunch of actors.